« Why Not A Duck? In 1966, whether you lived on a farm or in a penthouse, chances are you heard that Lovin Spoonful hit floating on the breeze. It was everywhere for a few weeks that summer while it rose to number one on popular music charts. With its catchy rhythm track that included the sound of car horns and even a jackhammer, the song evoked the kind of pressure cooker atmosphere that makes living in a major city such an adrenaline boost. You either love it or you don’t. I did. Having been raised in the suburbs, I couldn’t wait to make my home in a city. In the summer of ’68, I lived in Washington, D.C.. The District is always full of energy and passionate people espousing causes. That summer was unique. The city was recovering from the riots that tore through downtown in the spring. Anti-war sentiment mixed with a surge of frustration and anger after the murder of Martin Luther King had left many people feeling hopeless and bitter. But life goes on. And when we have a choice of either working to make things better or tearing down the whole country, I’d like to think our better natures will prevail. They did in 1968. People regrouped, rebuilt, and continued the process of trying to make things better for everyone. 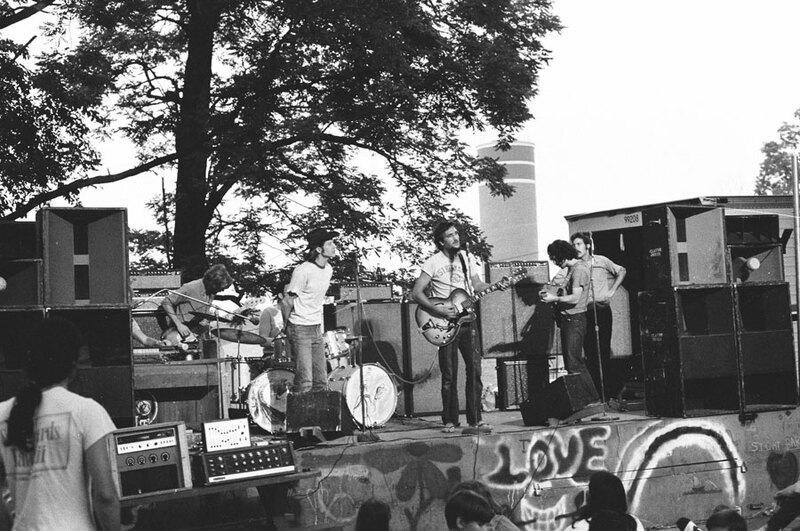 One of the small steps taken in that summer of 1968 was the beginning of the summer in the parks free music concerts at Fort Reno Park in the Tenleytown neighborhood. Tenleytown was fairly low-key back then. There was no Whole Foods, no metro stop, and Wilson High School was relatively small. The stage was nestled under some trees next to a basketball court. The concerts were casual and eclectic. I have fond memories of those first few summers in the city. The city has changed a lot since then, but I was happy to see that the Fort Reno concerts are still going strong. Stronger than ever in some ways. The stage has been moved to an open field, and the crowds are much bigger. In fact, the scene has become so popular that this week there was talk on the news about shutting it down because the Park Service wanted organizers to provide paid security staff. As there is no budget for this, there was concern that it would be the end of an era. At present, it looks like the crisis has been averted, and I, for one, am glad. Summer in the city, any city, is a special time. When large numbers of people live in close proximity to each other, their chances to interact are influenced by the architecture of the city in which they live. Unlike New York City, D.C. has no Central Park. Our riverfront is a work in progress. But our parks are vibrant and plentiful and full of life in the summer. The chance to enjoy free music together is an essential element of our shared environment. Another song that got a lot of airplay in the late sixties was “Get Together.” Written by Chet Powers in 1964, it became a hit after The Youngbloods released their version in 1967. The lyrics might strike modern ears as too earnest and sappy, but the message still resonates, even for today’s bright young millennials with their cute chapeaux and sustainably sourced optimism. You need a lot more than love, of course. You need affordable housing, a decent job, access to health care — subjects too weighty for popular music. But lightweight as it may be, the songs of summer help lift the mood when the going gets sweaty. It’s July. Let’s get together and celebrate the music of warm summer nights.